Anyone else have canvas on her boat? Yes?! I do. Lots of it. Big and small. Canvas is important protective covering for your boat. 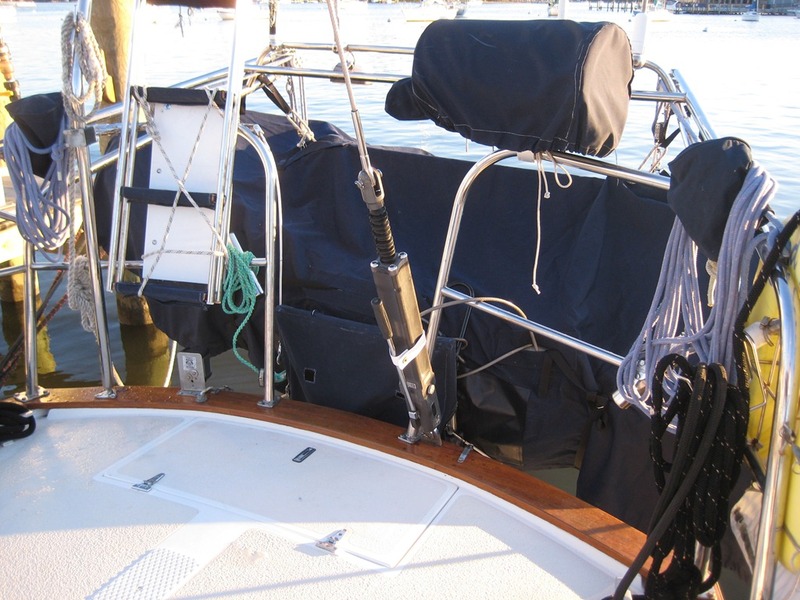 It saves you money and time by protecting teak from the sun, keeping dirt out of your winches and instruments, and keeping you cool at anchor. Can you guess how many different canvas items you have on board? Quick without looking. I counted 20+ unique items with some items having multiples in use at any given time on our Morgan sailboat, Magnolia. That doesn’t count functional and decorative fabrics below. And I have plans to add more canvas on my growing sewing projects list! How many unique canvas items can you find on Magnolia’s stern? If you are like me, a Seamless Sailor, you don’t want to rely on a canvas maker for all your canvas projects. We are self-reliant sailors, right? We can figure out how to make much of what we need and for less money. You want your canvas to last for maximum use and value. But whether you sew or not, we all need to take care of our canvas so it can provide long service for our boat and it’s equipment. Here are five tips that I’ve gleaned from my research and experience to keep your canvas serving you and your boat well for several years. 2. Bimini care – If you have a bimini or enclosure it is likely the most expensive canvas item aboard. Hose it down when you have plenty of water to spare, as above – monthly if possible, and before you store it for the season if you are putting your boat up. Be sure it dries completely before you store it. When you reinstall a bimini adjust it so it fits tight and water will run off. Try and remove environmental dirt and bird droppings as often as possible. Lubricate zippers as needed or once a season to keep them running smoothly. We use Boeshield T-9 on Magnolia. Try not to force zippers. 2a. Eisenglass – While we’re talking about biminis…take extra care of your soft plastic dodger and side enclosure curtains. This plastic is coated with UV protectants that we need to preserve to extent its life. In my research I’m finding a wide array of advice from use nothing but vinegar and water and a microfiber cloth after rinsing off salt and dirt to recommendations to use expensive products recommended by Strataglass, like IMAR. We are using Plexus on our old plastic curtains and like the results. We may reevaluate that for our next enclosure. Again no detergents nor sunscreen from your hands. Store the curtains flat between sheets or felt for longer term storage or you can roll them, but never fold. I see some boats have snap on covers for their dodger and side curtains. A great idea to reduce sun exposure. Most important is that this plastic is expensive, so treat it with TLC on a regular basis. 3. Waterproofing – don’t forget to condition aging or leaking biminis with a waterproofing solution. If water isn’t beading or pooling on the canvas, it’s time. Jan Irons of Commuter Cruiser says that dirt may be the culprit of leaking biminis. If there is dirt on the fabric when you apply waterproofing you may not get a good adhesion. The waterproofing washes off in the next rain. What a waste of time and money. Be sure to hose the bimini down and let it dry before applying a waterproofing solution. Again my research is that there are all level of waterproofing solutions and varying admiration of each. Some swear by less expensive Scotchguard. 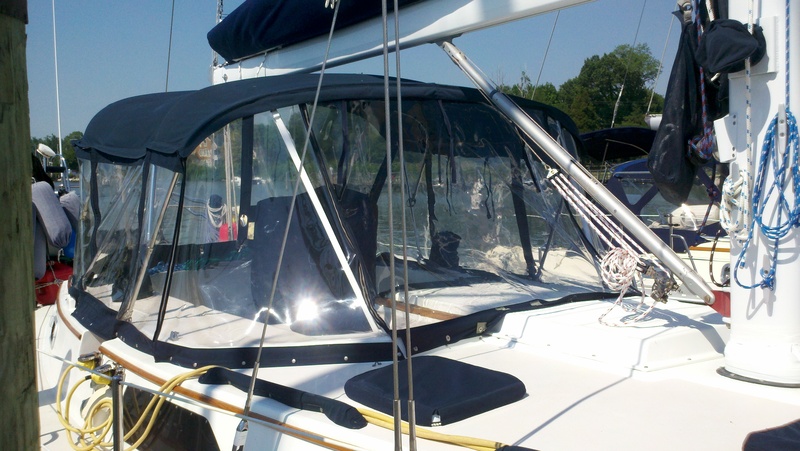 We use Marykate and have found that it worked well, but our current bimini is of unknown age. With newer fabric I’d go with what Sunbrella recommends – 303 Fabric Guard. Practical Sailor magazine (June 2004) testing agrees. 4. Stains – Get them off as fast as reasonably possible with as minimal abrasion as possible. Check out the stain removal chart on the Sunbrella website for advice on specific stain types. There are homemade solutions with products aboard to try before spending money on stain removers and creating one more bottle to store. 5. 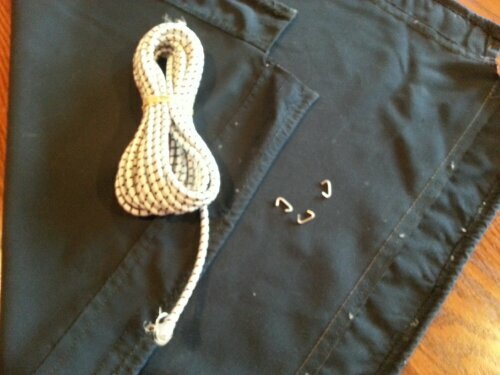 Keep up with repairs – If you have an area that rubs against something hard like my aging companionway cover does over the ring for the hatch board lock, add chafe guard such as Shelter-Rite (available from Sailrite) before it becomes a hole that is completely chafed through. Or add patches on both sides with additional Sunbrella. Trim any seams that show fraying. Better yet use an electric hot knife or soldering tool to seal any raw edges that appear. Secret tip: When I get out my hot knife I use it on a safe surface like a marble cutting board slab. My safety surface on the boat is a square of plywood. I tell my husband that it is on so he doesn’t come up and surprise me while I’m using it. I also say my mantra “Fear the Tool!” to remind myself to use it safely every time. I don’t even want to think about getting burned by it. Parts to replace old shock cord on a hatch cover. 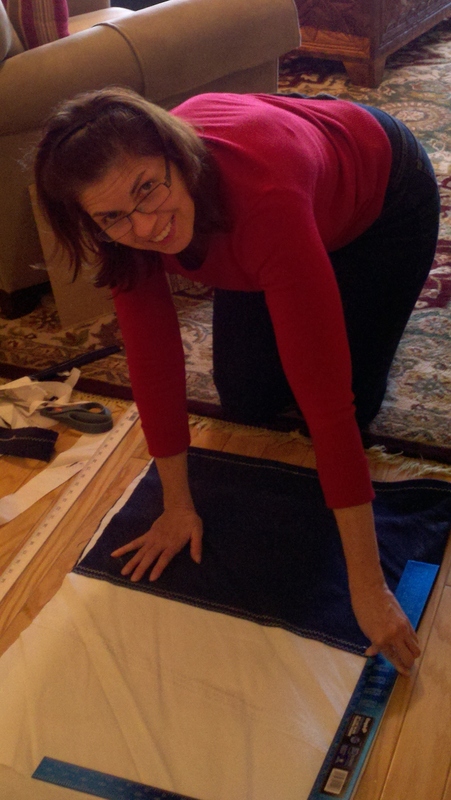 No sewing machine needed! With these tips and the following resources, you should have a good base of information to help keep your canvas in working order for several years. Have other valuable canvas care tips? Feel free to leave a comment here or on the Seamless Sailor blog (www.seamlesssailor.com). http://search.sailrite.com/?freeText=caring%20for%20canvas – free download and video on caring for Sunbrella.. Secret tip: Actually some of the best information is in the back of the Sailrite printed catalog. They include Sunbrella care instructions and a stain removal guide. http://www.sailnet.com/forums/gear-maintenance-articles/19834-winter-canvas-care.html – Good details about putting up your canvas for the off season. http://www.pamlico-nc.com/canvas.htm – Great suggestion for avoiding mildew. A Seamless Sailor takes pride in being self-sufficient when it comes to making canvas or other soft goods for function or design on her (or his) boat. There are lots of pre-made items on the market and many excellent custom canvas shops. But having custom items made can be expensive and buying items can be a challenge if you can’t find exactly what you want, the color, or the size for which you are looking. The Seamless Sailor blog is a place to gather information, and share ideas and resources with other cruisers. Check it out at www.seamlesssailor.com. Annette and her husband, Anthony, caught the sailing bug in 2009 after sailing with Suzanne and Ty Giesemann on S/V Liberty. (Suzanne is an author of several books, including It’s Your Boat Too.) Following ASA sailing lessons from the Pentagon Sailing Club and Sistership in Tortola, BVI and help from wonderful sailing friends, they bought their 1990 44′ Morgan, Magnolia, in 2010. They currently sail the Chesapeake Bay as weekend cruisers, but plan to head south in fall 2013. They would love to hear from other “Class of 2013” first-time cruisers. Your hatch cover looks interesting. Been trying to figure out how to secure one. Can you show some more pictures? Thanks!